Last blog as in below URL highlighted on the advantages of embedded TM in S/4HANA 1709 release. That blog was written prior to the formal release of S/4HANA and holds good excepting the Sales order scheduling. As per SAP’s present roadmap, the feature for Sales order scheduling is not included in their 1709 release but expected to be provided in the future release of S/4HANA. Simplification in the process as depicted in the flow diagram also happens as embedded TM eliminates the Delivery based transportation requirement (DTR) as a separate document as Freight unit is created in embedded TM directly from the delivery in S/4HANA. Hence, embedded TM eliminates the duplication of logistic information in the form of DTR as needed in case of standalone TM. SAP has also simplified the integration of sales order or delivery with embedded TM w.r.t standalone TM. 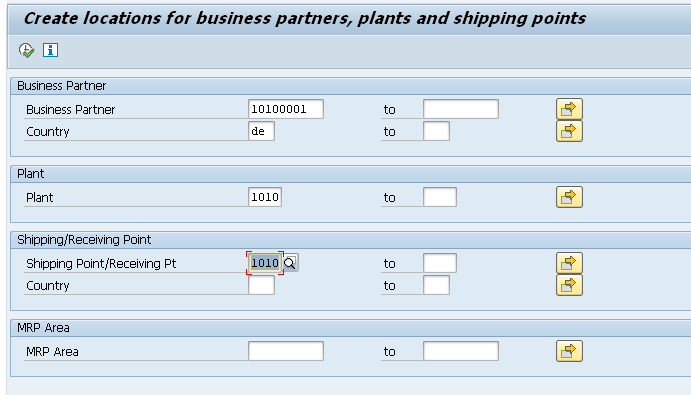 Sales orders or deliveries are distributed to SAP TM (standalone) through output / XML messages. However, no such distribution is required in case of embedded TM. Freight orders are created directly on the creation of delivery in case of delivery based integration and appear in table /SCMTMS/D_TORROT. Logistics integration profile (not in standalone TM) to be created as in path IMG->Transportation management->Integration-> Logistics integration->Define Logistics integration profile . Freight units are directly created from delivery and hence the Freight unit building (FUB) rule or condition for FUB for needs to be specified in Logistic integration profile as shown in below image. Integration of delivery to be activated (same as in case of standalone TM) as in path IMG->Transportation management->Integration->Logistics integration->Activate integration of delivery documents. 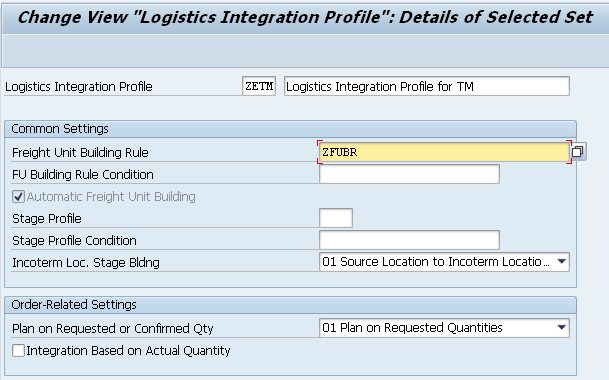 Logistics integration profile as created in the previous step needs to be assigned corresponding to the shipping point and control key as in below figure. Above steps are for integration of delivery and the same for sales order integration is similar. Hence, the integration in embedded TM is very simplified w.r.t standalone TM. As of 1709 release, embedded TM needs to be integrated through web services for embedded EWM. However, SAP is working towards much simplified integration between embedded EWM and embedded TM in a future release.